After entering any of the various rate-based resource costs, cost resources, and fixed costs, you’re ready to check if the overall project cost is within budget, but it’s not very clear where to find that cost total. That’s because cost totals for the project, tasks, resources, and assignments are available in different views, and for some cost totals you open the Cost table to see them. Choose Project > Project Information. In the Project Information dialog box, choose Statistics. 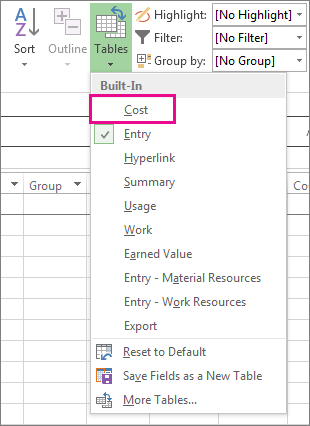 In the Project Statistics dialog box, review the cost totals for the project in the Cost column. Tip: You can also see this cost total on the project summary task in the Gantt Chart view. If it’s not shown, select the Project Summary Task box on the Format tab. On the View tab, choose the arrow for Gantt Chart, and then choose More Views. In the Views list, pick Task Sheet, and choose Apply. Choose View > Tables, Cost to apply the Cost table. In the Total Cost field, review the cost total for tasks. Note: If your tasks total costs appear to be incorrect, see the troubleshooting steps below. This view shows tasks with the resources that are assigned to them. The cost of each task reflects the resources assigned to it. Check the assignment total costs and the task's total costs by using the Task Usage view with the Cost table applied. Look for any per-use costs or fixed costs that may have been overlooked. Verify total costs at the task-level. Fixed costs do not roll up to the Fixed Cost field at the summary task-level. Verify that all resources with cost information are assigned to tasks. Verify that you have applied the correct cost rate table to the resource assignment.